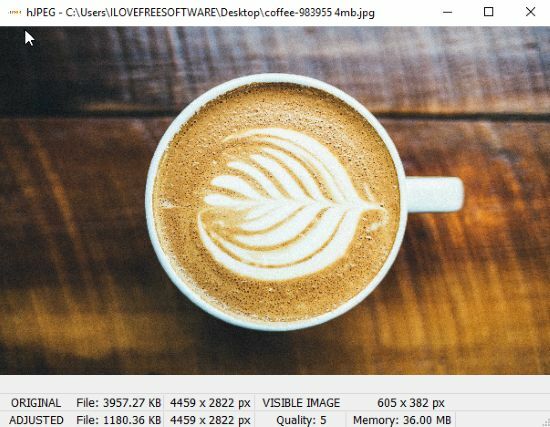 hJPEG is a free JPG compressor software that can compress images up to 60%. Even after compressing up to 60%, the output looks good. The software lets you compress images between 1 to 10 levels. Where 1 is the greatest compression level, 10 is the lowest compression level. 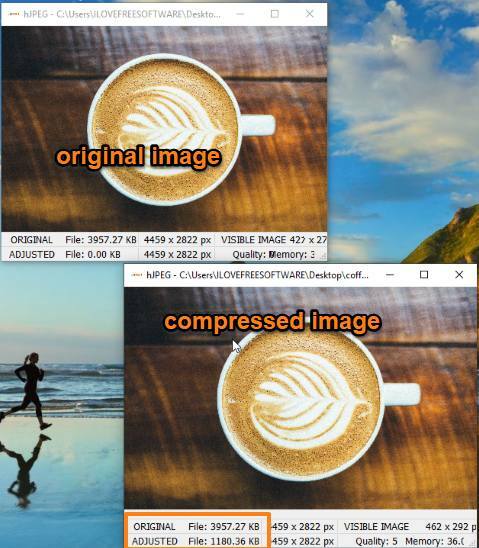 This free JPG compressor software also lets you view the input image and output of the compressed image right on the interface. You can drop an image on hJPEG software interface and then you can view the original image. Use a compression level and the compressed image is also visible there. This helps to preview the output before saving the image. By reducing image quality, you can also save hard disk space by compressing JPG images having size in MBs. There are many other online websites and software that let you customize the images. In some cases, you need to install software to compress the image. But this JPG compressor doesn’t need to be installed, you can just run its exe file to bring up its interface. The very first step is to click on download hJPEG that is available on the site. Then, it will provide you the link which you have to download at the desired location in your device. After downloading, you will see a zipped file named hJPEG file in your system. You have to unzip it. It will create two files in which the first one is the hJPEG interface and the other one is the demo text file. To customize the image, you need to open hJPEG interface which looks blank. Thereafter, you can copy and paste or drag and drop the file in order to proceed with its customization. You can see in the above image, here I dragged an image with the file size 4MB. Before we compress this image, just look at the bottom. Here, you can see the original and adjusted file. In the original file, you can see the actual size and dimensions of an image. The adjusted image file size is 0.00 KB because I have not compressed the size yet. To start with the compression of an image, you need to press numbers from 1-10 on your keyboard in order to reduce the size. Pressing 1 means the lowest quality compression of the image and pressing 10 is the highest quality compression of the image. However, it depends on the picture and what size you choose to compress. You can see the above image, here I pressed number 5 to adjust the size and quality. Now, the adjusted file size is 1180.36 KB whereas the original file size is 3957.27 KB. You can check the quality by using other numbers like 1,2,3, etc. The reduction of an image and image resolutions are visible right there in the interface. Once, you are done with the compression, you can save the image by right clicking the mouse. All the images will be saved in JPG file format. Apart from the image compression, you can also read this article to compress GIF, JPG, PNG, SVG size. I personally liked this JPG compressor as there is no need to download a software. You can just download the zipped file and compress images on its interface. You can compare the quality of an image by clicking different numbers from 1-10 on your keyboard. It lets you see the size of an image before saving the picture. So try this handy tool to make your work easy.